Local confectioner, Champion and Reeves have been using Rowlands for a little under a year now, and are more than happy with the service they have been receiving. The high end confectioner sources all of their products by hand to ensure that their exacting standards are met – co-owner Jacqueline Champion has been talking to Rowlands about their product range, where they are stocked and why they use Rowlands for their butter, cream and pistachios. Champion and Reeves buy unsalted butter and fresh double cream from Rowlands for their butterscotch and toffee, and Pistachios for their unrivalled traditional dessert nougat. Many of their ingredients are imported due to the ingredients needed to create the delicate flavour balances in their confectionary, however, where possible, the Shrewsbury based artisan producer uses local ingredients in line with both their environmental ethics and their belief that where possible, they should source their supplies locally, an ethos shared with Rowlands. Champion and Reeves is a small operation, having just relocated to Vernon Drive on Battlefield Enterprise Park, a larger site with room for expansion. The company currently supply both local and national independent retailers with traditional nougat, butterscotch and toffee. The confectionary is natural gluten and gelatine free, and free of palm oil due to the manufacturing process only using natural ingredients. And the individual portions of the butterscotch, toffee and nougat are only 65kcal – making it lower in calories than many of the market leaders. 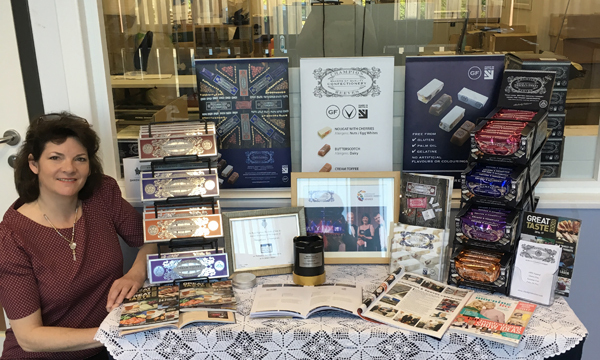 Taking inspiration from Callard and Bowser – Scottish confectioners established in 1855, Champion and Reeves are believed to be the only manufacturer of traditional butterscotch in the UK, and one of the only manufacturers of traditional dessert nougat in the UK. The current site was opened by HRH The Duke of York on March 17th 2016, who stated that Champion and Reeves products had been enjoyed at Sandringham over the Christmas period. Independent businesses who would be interested in stocking Champion and Reeves should contact them directly, their online shop stocks all of their products and can be bought as either gift boxes or personal packets.